2015 proved to be a very difficult year in Nigeria. Ngozi Okonjo-Iweala, Nigeria’s former Finance Minister warned, just before leaving office, that her successor would face a “difficult” year due to plunging oil revenues. She opined that the economy needs expert management to weather the storm. “We have a serious situation with a cash crunch,” she stated in an interview in Cape Town at the World Economic Forum on Africa. The main economic spender in Nigeria is “The Federal Government” and they are not spending any money, thus, the private sector is struggling to make any income. The second major economic spender in Nigeria is “The Oil Industry”, and they are also facing one of the most difficult eras in recent history. As state governments are struggling to pay salaries, they are seeking bailout packages from the federal government to remunerate civil servants. In addition, capital projects are being halted all over the country. However, in the midst of this seeming economic downturn, Lagos State has been surviving due to its solid internally generated revenue (IGR). In 2014 it generated more than 250 billion Naira, ($1,383,540,000 USD) according to a 2015 report by the National Bureau of Statistics. In the same year, I conducted a doctoral ethnographic research on the rules governing economic lives in Lagos. One of the evenings while reflecting on my field notes, I picked up on a theme; all of my respondents up until then claimed to be businessmen or stated de facto “I am into business”. I had interviewed 19 people as at then, and in my thinking I thought I had carefully selected my interviewees amongst traders, small business owners, small firm and big organisation employees. But here I was noticing that all of them referred to themselves as business owners, businessmen or “into business”. This implied that a good number of jobs in the so-called formal and government sector hardly offered job security, or there were cases of delayed or withheld salaries, and individuals had to engage in other activities usually in the informal sector to generate income. 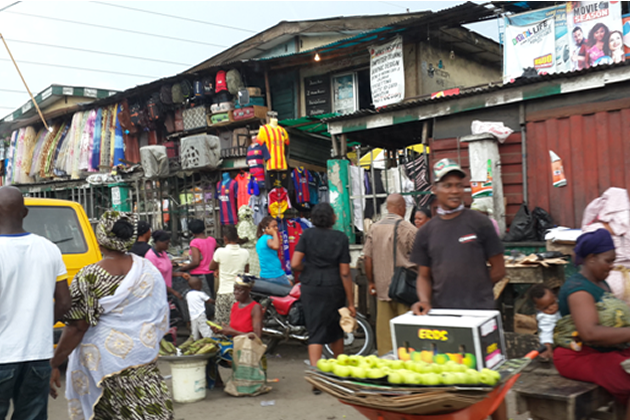 This then led me to further interrogate my findings and explore in depth the nature of the informal economy in Lagos. Lagos has a relatively strong formal sector with growth potential. However, the vast majority of its people live in informal settlements or densely populated areas and work in the informal sector. The simplest definition of the informal sector all over the world is the part of an economy that is neither taxed, nor monitored by any form of government; yet, does this definition really hold in Lagos? It was almost impossible for us to tax the market women or should I say the informal sector on any transaction let alone profit. Many of them said they could not even write; talk less of keeping book records. I mean Nigeria is a cash-based economy; most of them didn’t even have a bank account. Initially we taxed them by given them a rate, when that did not work, we instead levied a fixed sum for different categories, that still did not work (I guess it was too high). Then we ran an enlightenment programme on government’s use of their tax payment, simply put, letting them know what we are using their money for, but this didn’t produce any result. We even sent out law enforcement agents to apprehend defaulters, this did not produce any meaningful result; rather it resulted in a standoff between the market people and the government. Now this is what we do in most cases: we discuss with the Iyaloja (a term used for a female head of market) pleading with her that we would love her to raise a certain amount from her market; by ensuring every member pays their tax. So the Iyaloja gathers the money on our behalf. Usually she divides the collection into groups, people in similar trades are grouped together and given a particular amount to pay. Therefore every month there is a particular amount of money that goes from the market to the tax station. Then the Iyaloja and the tax revenue officer of the market go to the bank together to pay it into the internal revenue account. The tax officer issues each trader a tax identity card and gives it to the Iyaloja and this card is used subsequently; so every year payment is made the card is updated. A general receipt is also given covering the group. For Lagos residents it is becoming more and more important to be in possession of such an electronic card which serves at the same time as an ID card. Whenever dealing with the city’s authorities, like enroling your child at a public school or solving traffic offences, it is a pre-requirement to submit your tax ID card. Findings show that the exchange of money involves trust, and this feature is especially important in Lagos. Previous experiences of the people at the bottom of the economic pyramid have ended up with them building distrust towards government. They simply believe their taxes will end up in private pockets of corrupt officials. 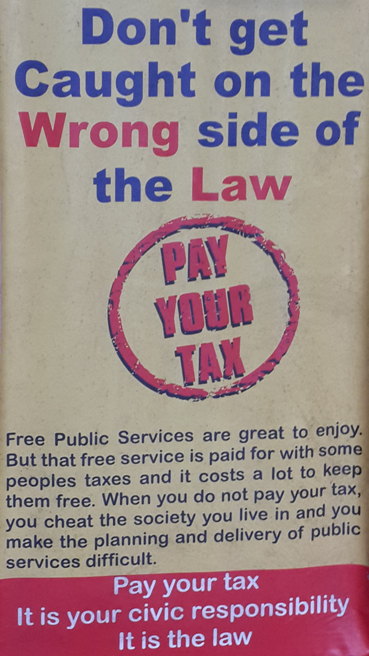 The government then needed to gain the trust of its citizens so as to persuade them to pay their taxes. The best way to build this trust was to ensure the taxes were promoted and collected by the market leaders or association leaders, which the informal business operators trusted. Therefore all traders situated in a market were mandated to register with the market association, and as the tax officer interviewee said: “…even to the smallest trader “de ori awon ton ta pomo” (even to the sellers of cow skin)…”. This is one of the reasons, government frowns at street hawkers; because they evade even this system of taxation. 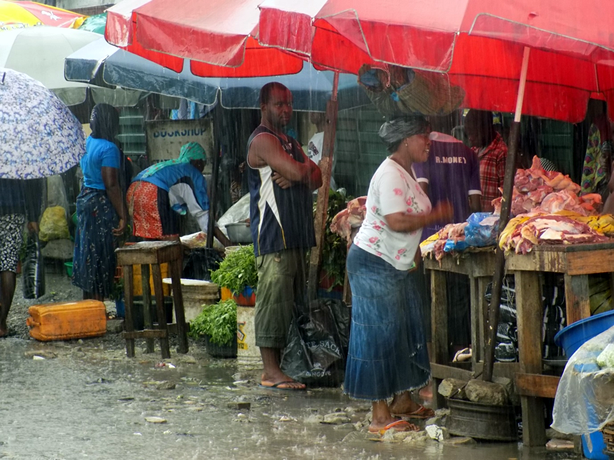 Then the tax authorities in the quest to capture the informal sector got smart and made a subtle agreement with associations and market traders, to tax individuals with a flat sum of N2,500.00 (circa $12) instead of a rate. It seems as if this approach has been massively successful, although exact numbers are not given by government, who obscures the income derived from taxation of informal businesses in a budget line called “Other Revenue”. Whilst taxes raised in the formal sector in 2014 amounted to just over 9 billion Naira ($45,090,000), the “Other Revenue” generated over 100 billion Naira ($500,000,000) according to the 2015 report by the National Bureau of Statistics. In order to assess the effectiveness of government – citizen relationships, it would be crucial for the government to reveal the exact figures here. This generating capacity has to be sustained by a mixture of methods; regularly tax officers from the audit department go to markets to inspect tax compliance, traders who pay taxes would show their electronic tax clearance card, and those who do not have the card are covered as long as they have the photocopy of the group receipt issued to the market or association leaders. Usually the market or association leaders paste the receipts on the front door of their shops. Usually when the market is organising any major event, the tax authorities supports them financially, and most times sends a member of staff to attend the event, so as to ensure the continuous sustenance of the relationship. The tax officers agree that without the support of the market or association leaders they might never be able to capture this class of people in the tax coffers. Also the tax authorities have a unit called TEET (Tax Enlightenment and Educational Team), that goes into the community to educate traders and people generally about the advantages of paying taxes and being tax compliant, letting them know what the government is actually doing with their taxes. They show pictures of roads, water boreholes, streetlights, gardening, people being employed, free school, free books at school, free school buses and also explain how tax payment reduces the crime rate. They also organise rallies, seminars and symposium, and they go to markets and companies. 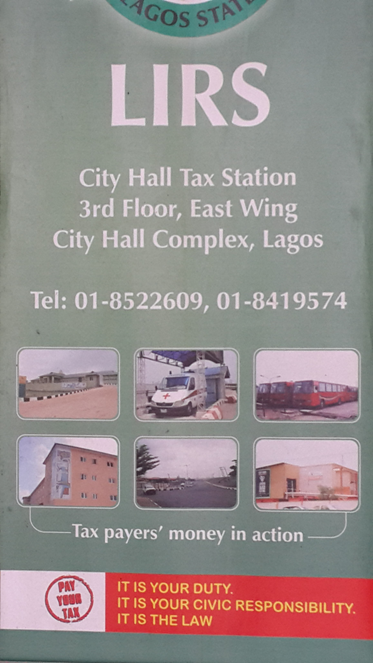 Also campaigns are used with prominent residents of Lagos across tribal, religious and professional lines in testimonial adverts on the importance of fulfillment of their tax obligations. The discussion so far have been to highlight how the Lagos government has thus far effectively managed the informal sector in the state. Albeit directed towards the government’s interest in generating revenue, one can assert that the Government has taken steps towards integrating the informal sector within the city’s economic planning and legal framework in form of tax receipts. On the other hand however, how ingenious or innovative has the government been towards this same class of people in integrating them in terms of creating job opportunities, providing social security, and also including them in its town planning models? With its stronger financial base, Lagos now seeks to pursue urbanization by developing model city plans, roads are being enlarged, markets built and rail lines being constructed. These city planning models have been conceived unilaterally by government officials and professionals in the name of growth and development. Petty traders and kiosk owners along the roads are losing their ‘workplaces’ and customer bases when roads are enlarged; old markets are destroyed and replaced with ‘modern’ facilities which the traders and market women can no longer afford. Earlier when these same set of people i.e. the government officials and professionals- independently came up with taxing models for the informal sector it failed woefully. Not until they decided to consult, and work with the individuals in the informal sector were they now able to come up with a successful taxing model. It is a worthy model that other states in the country and even other developing societies are seeking to emulate. The government of Lagos will do well to take note of this model and now adopt it subsequently to commonly discuss and decide on the transparent and fair use of the resources generated through its citizens. This post was originally published on the Heinrich Boell Nigeria blog. It has been re-published with permission.